From the orange desert of rural Australia to the snowy wastes of Siberia, from a Colorado jailhouse to a town square in northern England, Carys Davies’ characters traverse expanses of solitude: restless teenagers, middle-aged civil servants, and Quaker spinsters contend with domestic abuse, marital strife and a myriad of other challenges—revealing, through their struggles, the secrets of the human heart. The seventeen stories in this lauded collection—written with prickly wit and punch, “as if Mark Twain and Annie Proulx had sat down at a desk together”—established Carys Davies among the strongest literary voices in Britain. The seventeen stories in this lauded collection—written with prickly wit and punch, “as if Mark Twain and Annie Proulx had sat down at a desk together”—established Carys Davies among the strongest literary voices in Britain. Finally available in North America, The Redemption of Galen Pike introduces readers to an author destined for international acclaim. Carys Davies is the author of two collections of short stories, Some New Ambush and The Redemption of Galen Pike, which won the Frank O’Connor International Short Story Prize and the Jerwood Fiction Uncovered Prize. She is also the winner of the Royal Society of Literature’s V.S. Pritchett Memorial Prize, the Society of Authors’ Olive Cook Short Story Award, a Northern Writers’ Award, and is currently a 2016-2017 Cullman Fellow at the New York Public Library. 1. While the title of this collection of short stories is taken from one story in particular, the theme of redemption appears in several of the stories. Choose characters from a few of the stories and discuss how they seek redemption. Do they attain redemption, and if so, do they do so in ways you expected? 2. Several of the characters face difficulties that result from being reluctant or unable to connect with other people for one reason or another. Identify some of the reasons that the characters in these stories find themselves isolated. Have you used any of these reasons/excuses to avoid making connections with people? 3. What does Davies reveal about the lives of outsiders and marginalized people by giving us a glimpse into their interior lives? Did reading these stories change the way you think about the lives of other people? 4. Think about the stories that surprised you the most. Why were they surprising to you? Did they feel emotionally true despite the surprises? Have you ever had emotional reactions that seemed contrary to what was “expected,” by you or by society? Discuss the story “The Miracle at Hawk’s Bay” in relation to these questions. 5. Some of the “twists” in the stories reveal the assumptions about stories that we make as readers, often connected to the stereotypical narratives tropes that conventional pop culture feeds us. Consider the first story in the collection, “The Quiet,” in light of these tropes. Discuss what your original expectation was for the story. Why did you jump to that conclusion? When you reach the final line of the story, how has your assessment of both characters changed? 6. Think about the collection as a whole. While many of the stories deal with dark subject matter and unconventional resolutions, the final story in the collection, “Sibyl,” concludes on a very different note. What was your emotional reaction when faced with this reversal? Do you think it was a good decision to end the collection on this story? Why or why not? 7. Did you have a favourite story in the collection? Why do you think it was your favourite? Carys Davies, author of The Redemption of Galen Pike, spoke with Natalie Hamilton about the her writing process, isolation and connection, and how surprise is a natural part of fiction. 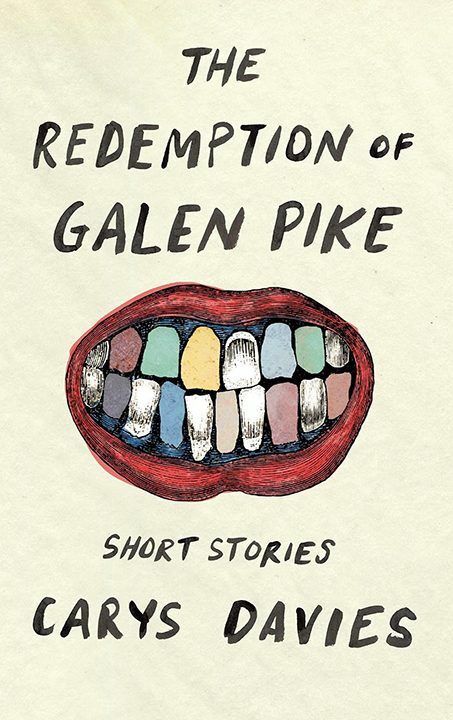 NH: The Redemption of Galen Pike is your second collection of short stories. Can you tell me a little bit about your writing process and the origins of some of these stories? CD: If I had to describe my ‘process’ it would be to say it’s a case of endless trial and error; a very long, drawn-out and chaotic journey for each story. Every time I sit down to begin what might one day be a new story, I’m almost overwhelmed by the feeling that I don’t know how to do it. Perhaps part of that comes from there being no pattern in terms of where the stories are likely to come from. I find it difficult, actually, to remember the first spark of any story. I write them over many months and often several years (the title story took ten years to write), and usually the trigger for the real story—the moment when I can finally see the wood for the trees—doesn’t come until I’ve been writing for a long time. There are a few exceptions, such as the story Bonnet, from this collection (which imagines an encounter between Charlotte Brontë and her young publisher, George Smith). This story came to me a few years after I’d read Charlotte’s letters to her friend, Ellen Nussey, and it arrived very quickly – mysteriously at first, with an image of a woman in a dark bonnet stepping into a railway carriage. I didn’t know who she was, only that she was travelling to London, but then I realised she was Charlotte and the rest of the story came to me very rapidly, within a day. Even here though, I think it’s true to say the story came through writing. Like all stories, it started with something small which snagged my imagination, or my subconscious or whatever you want to call it, and wouldn’t let it go. Almost always, I start with something that’s been sitting at the back of my mind for years and see where it takes me. Very often the moment when it begins to feel like a story is when it sparks a connection with something completely unrelated. If there’s one thing that’s constant about the way my stories come to be, it’s that I never know where I’m going and always end up a very long way from where I start. If there is anything that could be called a ‘process’, I think it’s a case of being alert to things which interest me or with which I sense some powerful emotional connection or possibility. And if I had to generalise, I’d say that, more often than not, it will have something to do with place, with the physical world, rather than with character. Character comes after for me; and I generally don’t know much about my characters to begin with. But once they walk onto the page, once I can see them, in this very real and tangible place in my imagination, then I can really start making things up. NH: The craft is immediately evident here, in your language and structure and insight. Craft is especially important for short stories where the impression must be made in a limited word count. How do you hone your stories to the spare, knife-point prose that we have in The Redemption of Galen Pike? or hundredth drafts doesn’t have much meaning to me—it sounds so organized! I love what the American novelist Nell Freudenberger says, that ‘a story begins as a blind groping in the dark for something, both resonant and concrete’. For me, the whole thing is more like spinning plates—you just keep putting them up in the air and see which fall back down and which keep spinning until you just have the few left that really matter. Short stories are such delicate, tense, fragile things—you can’t overload them or they’ll turn to dust, collapse. Each one finds its own form eventually, and is as short, or as long, as it needs to be. Over the months and over the years, I write sentences and paragraphs; I try endless different ways of telling the story, changing it until, through the writing, and over time, I discover what I should be doing. Often that moment comes when I see who is telling the story, and why. It sounds simple but it can take me years to get there. With the title story, The Redemption of Galen Pike, for example, all I had in the beginning was a man in a cell. I didn’t even know what he’d done wrong. Later, I began writing about another man who came to visit him and they talked. I probably wrote over a hundred pages of scenes about Galen Pike and this man, but somehow the story never took flight. Neither the man nor Galen Pike seemed to have enough of a stake in it. Then one day, much later, that male visitor turned into a woman, Patience, and she and the prisoner hardly spoke at all. I understood that Patience was a Quaker, and a spinster, and I knew it was time to put the first hundred pages I’d written aside and keep the three pages I had with Patience, and go from there. So yes, there’s an awful lot that gets discarded. One of the reasons I write longhand is that I’m terrified that on a screen I’ll end up deleting precisely those bits I should be keeping. It’s never a linear process – yes, you can discover that you’ve been on the wrong track for months or years, but that doesn’t mean that all that time, all that writing is wasted. I keep everything, and sometimes find myself going back to scraps of writing from early on in the development of a story because they have often a freshness and a simplicity and an urgency that you can lose, the longer you work on something. NH: The stories in this collection cover a lot of ground, geographically, from the Australian outback to snowbound Siberia. Have you travelled a lot yourself? How does that inform your fiction? CD: I’ve travelled a lot in Europe, I’ve been to India and I lived in the United States for 11 years during the 1990s, all of which, I’m sure, must have had some impact on the way I look at the world, but that said, on the whole I very rarely write about a world that’s recognisably mine or that’s familiar to me. The Travellers in this collection, for instance, is set in Siberia, and the opening story, The Quiet, in the Australian outback and I’ve never been to either. For that matter, I’ve never been to mythical Scythia either where one of the other stories, Myth, is set; in my first short story collection Some New Ambush, there’s an island where everything is red, and I’ve never been there either. I like to travel far, far away from my own life in my fiction, often to some historical, mythical, or imaginary past. I think the distances in time and space between the life I know and the ones I’m trying to conjure up, frees my imagination. It’s in making things up that I feel I have a better chance of getting closer to the truth. NH: Many of the stories in The Redemption of Galen Pike touch on the theme of loneliness or solitude. In a world that seems increasingly distanced from authentic human interaction because of technology (and the accompanying shallowness of emoticons and “likes”), I found many of the stories particularly poignant near-fables about the necessity of connection and love. Solitude is not a negative thing, of course, but the feeling of isolation is, and many of the characters in these stories feel isolated because of shame, or fear, or obligation, or even the idea that reaching out is somehow an imposition. Can you talk a little bit about the tension between isolation and connection as it comes into play in your stories? CD: In some ways in this collection I’m taking issue with Donne’s notion that ‘no man is an island’. Every man is an island: it’s what makes us human, and it’s what makes life so complicated. So much comes from that. I’m interested in how hard it is to know other people—what they’re thinking, what they’re feeling, what they’re hiding. There are all sorts of reasons, of course, why we keep secrets, or why we can’t talk about something to another person—shame, desire, self-preservation, guilt, social standing; all kinds of reasons. I’m interested in those dramas of separation, and in the moments where the barriers come down—in the quietly powerful bonds that are forged between people from different worlds or backgrounds, like Patience Haig and Galen Pike in the title story, and Susan Boyce and Henry Fowler in The Quiet. I’m also interested in those moments of near connection—those almost-bonds which never quite happen, like the gulf that remains between Cheryl, the Haitian babysitter and her employer, Nancy, in The Taking of Bunny Clay, or between the middle-aged alderman and Queen Victoria in Jubilee. A lot has to be left out in a short story and that appeals to me—works for me—because my characters often can’t say the things they want to, or are deliberately not saying them. The brevity of the short story form means that there are, necessarily, gaps and spaces, and I rely on those spaces— for example what’s not being said between Patience and Galen Pike—to give the stories their power. It becomes apparent to the reader how emotionally charged those spaces and silences are—that there are things the characters aren’t saying to each other, and possibly not even to themselves. NH: One element of the brilliance in your stories, as I see it, is in your use of reticence and ambiguity in clever combination. By not spelling everything out for readers you leave room for them to fill in the gaps with their own assumptions which you then subvert. These subversions are remarkable in that they never feel like trickery, but rather they reveal another emotional truth that may inspire readers to think more deeply about those assumptions that were proven wrong, and in that way to perhaps deepen their capacity for empathy. This is a very long-winded way to ask whether you think literature has a moral impact on people, and if so, do you think about what effect you are trying to achieve when you are writing? one reason why life is full of surprises, often nasty ones. So for me, surprise feels like a natural and important part of fiction, because it is part of life. As far as the stories having any kind of moral impact—no, that’s not something I ever set out to achieve. I wouldn’t ever want my stories to be morality tales. But I’m very interested in morality. The Quiet and The Redemption of Galen Pike both question conventional notions of right and wrong. And On Commercial Hill, with its ambiguous, cliff-hanger last line, does end on a kind of moral precipice: faced with a choice between his lover and his daughter what will this man do next? All that aside, I can see that there is one story, Precious, which turned out to have a moral edge that I didn’t intend when I started but which emerged through the writing. The story began as the tale of a rather lost and deluded man who is treated as a kind of god by the people of the town he wanders into. I wasn’t sure where the story would go, but I liked the ‘Emperor’s New Clothes’ moment where the girl, Precious, challenges the baselessness of the people’s belief in their new god. And I began to wonder: what might a god think about being held captive, a hostage to those who believe in him, and who do unspeakable things in his name? So while I didn’t plan to write about religious fanaticism, the ending is a fairly resounding denunciation of its wicked power. NH: Is there a question you haven’t yet been asked about the book or one of the stories that you would like to answer here? CD: I answered one of your earlier questions by saying that I rarely write about a world that’s recognisably mine; I don’t think of myself as an autobiographical writer. But it might be interesting to note that one of the stories here, The Travellers, in spite of its chilly Siberian setting, is rooted in an aspect of my relationship with my husband. Something we fight about all the time—something a lot of people fight about. Something trivial and daft but which somehow provokes the most visceral emotions. I think of it as a sort of letter to myself, to say how pointless it is to cut off your nose to spite your face; to kiss, I suppose, and make up.